Static and dynamic cut-growth fatigue characteristics of silicone-based elastomeric sealants. Correlation of changes in sealant properties produced by laboratory ageing techniques and those observed in anturally weathered samples. Fatigue resistance of a polysulphide sealant injected in various rectangular cross sections. Comparison of short-term ageing methods for sealants. The prediction of long-term sealant performance from dynamic accelerated weathering. Ageing resistance of sealants. 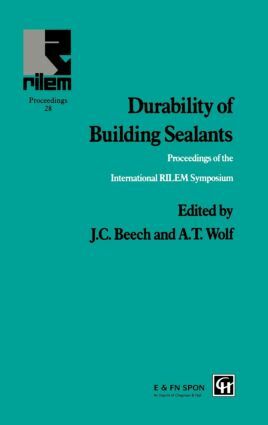 Contribution to validation of laboratory test methods for prediction of the durability of building joint sealants. Durability of resealed building joints. The contribution of research to the standardisation of sealants.